The last 24 hours has seen a small amount of joy for the crews of Spindrift 2 and IDEC Sport in their respective quests to break Banque Populaire V's time for the Jules Verne Trophy record, non-stop round the the world. 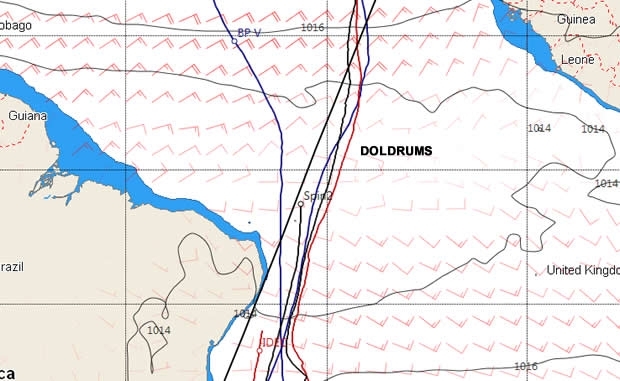 On a day four years ago when Loick Peyron's record breakers were slowed marginally as they tackled the Doldrums and then waited for the northeasterly trades to fill in, so Spindrift 2 and IDEC Sport have been making better speeds as they've headed up the coast of Brazil. Because of this they have 'stopped the rot', temporarily at least, with Spindrift 2's deficit on the record pace down from 790 miles 24 hours ago to a slightly more manageable 563 at 0930 UTC this morning. Understandly IDEC Sport still has her work cut out, but she too has made gains, her deficit on Banque Populaire V's pace down from 1339 miles yesterday to 1173 at 1010 UTC this morning. Spindrift 2 passed Recife yesterday evening at around 2000 UTC on a course that has taken her some 90 miles to the east of Banque Pop's track. Next stop is the Equator some 144 miles away, which means, given that she is averaging 25-26 knots at the moment, she should cross back into the northern hemisphere mid-afternoon today. She then has the Doldrums to cross before spearing off to the northwest. Thanks to the position of the Azores high we expect Spindrift 2 to follow a similar track to Banque Populaire V (see below). On her record attempt Banque Populaire made her 'big turn' northeast on the equivalent of this Saturday night. Looking at the GFS forecast - on Saturday night the Azores high will still be enormous, a sausage-shaped area running from Gibraltar most of the way across the Atlantic towards the Bahamas, but it will be in the process of receeding east. If this proves correct then Spindrift 2 may be able to cut the corner and sail a slightly shorter course than Banque Populaire's extreme westerly routing. This is of course based on a long term forecast, and the wind angle is more dead downwind than is ideal but it may allow Spindrift 2 to avoid Banque Populaire's extreme detour that at one point had her some 1700 miles adrift of the great circle between Brazil and the finish. While she will struggle to make up the miles on Spindrift 2, IDEC Sport has an opportunity in that, through being more than a day behind, she may be able to cut the corner around the west side of the Azores high more than Spindrift 2 can. For both boats and their crews, the last 2500 miles will be all about who can jump the best between the various meteorological phenomenon they will encounter en route to the finish.